With apologies once again to Rogers and Hammerstein, here are my top 10 favorite things (book-wise) from 2011. I have restricted myself to books reviewed here at The Fourth Musketeer. The books are presented in no particular order. Please note: these are not necessarily the books I think are "best" (whatever that means!) but rather books that I found personally compelling for one reason or another. 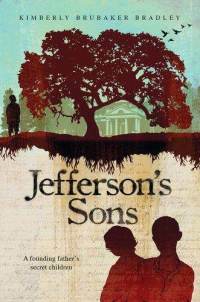 Jefferson's Sons: A Founding Father's Secret Children, by Kimberly Brubaker Bradley (Dial Books for Young Readers). A fictionalized look at life at Monticello through the eyes of three of his slaves, two of whom were his sons by his slave mistress, Sally Hemings. Between Shades of Gray, by Ruta Sepetys (Philomel). In 1941, 15-year old Lina, her mother, and brother are taken from their Lithuanian home by Soviet guards and sent to Siberia, where her father is sentenced to death in a prison camp while Lina fights to survive. Based on the author's own family history. The Berlin Boxing Club, by Robert Sharenow (Harper Collins). In 1936 Berlin, 14-year old Karl Stern, considered Jewish by the government despite a non-religious upbringing, learns to box from the legendary Max Schmeling while struggling with the realities of life as a Jew in Nazi Germany. Saving Zasha, by Randi Barrow (Scholastic). In 1945 Russia, those who own German shepherds are considered traitors, but Mikhail and his family are determined to keep the beautiful dog a dying man brought them, while trying to keep the secret from Mikhail's nosy classmate Katia. Inside Out and Back Again by Thanhha Lai (Harper). In free verse poems, a young girl chronicles the life-changing year of 1975, when she, her mother, and her brothers leave war-torn Vietnam to resettle in Alabama. For the Love of Music: The Remarkable Story of Maria Anna Mozart, by Elizabeth Rusch (Triangle Press). A lovely picture book biography of the sister of the famous composer. These Hands, by Margaret H. Mason (Houghton Mifflin). Combines a little known piece of labor history and the civil rights movement with a tender portrait of a grandfather’s relationship with his grandson. Flesh and Blood So Cheap, by Albert Marrin (Knopf Books). 2011 marked the 100th anniversary of the Triangle Fire, the worse disaster in American labor history, and Marrin brings the tragic events of that spring afternoon to life, setting the fire in a sweeping historical narrative encompassing not only the events leading up to the fire, but what happened afterwards. Tom Thumb: The Remarkable True Story of a Man in Miniature, by George Sullivan (Clarion Books). The fascinating story of the little person Charles Stratton, “discovered” by P. T. Barnum at the tender age of four; Tom Thumb was one of our nation’s first true celebrities. 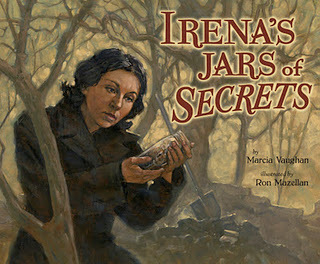 Irena's Jars of Secrets is the second picture book to come out this year on Polish heroine Irena Sendler, a young social worker who rescued over 2,500 Jewish children from under the noses of the Nazi guards in the Warsaw Ghetto during World War II (earlier this year I reviewed Irena Sendler and the Children of the Warsaw Ghetto, by Susan Goldman Rubin). Both are well-written, worthwhile books, although they cover much of the same territory. Irena's father, a Polish doctor, taught his daughter that if she ever saw someone drowning, she must jump in, even if she didn't know how to swim. Irena took his teachings to heart, and when the Polish Jews were forced into the Warsaw ghetto, dying of starvation and disease, she knew she must do something to help. Dressed as a nurse, she smuggled in food, medicine, and clothes, but that wasn't enough. Soon she joined the Zegota, a Polish organization established to help the Jews, and started smuggling children out of the ghetto however she could--finding families that would take them in. She kept careful records of the names of the children and where they went, so that they could be reunited with their parents after the war. These important notes were hidden in small jars and buried under the apple tree in a friend's garden. Irena's work was terribly dangerous, and she was eventually arrested by the Gestapo and sentenced to death. Zegota members managed to rescue her through a bribe, and she continued to work for the resistance until the war ended. Although Irena was able to retrieve her precious records, very few of the children were able to be reunited with their parents, most of whom had perished in death camps or the ghetto. Still, relatives were able to be found for some of the children. Irena's remarkable story was ignored in Poland until very recently, although she was honored in 1965 by Israel's Yad Vashem as one of the Righteous Among Nations, those Gentiles who helped Jews escape the Nazis. She passed away in 2008 at the age of 98, but as author Marcia Vaughan concludes in her afterword, "her story of caring and courage lives on." Ron Mazellan's rich oil painting illustrations capture the somber mood of this time period, with dark colors, broad, energetic, brush strokes, and dramatic lighting. To learn more about Sendler, you may want to watch a documentary about Sendler's life entitled Irena Sendler: In the Name of their Mothers, which was broadcast on PBS affiliates in May of 2011. The documentary features some of Sendler's last interviews. Disclosure: Review copy provided by NetGalley. 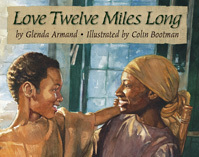 Based on the childhood of former slave, author and abolitionist Frederick Douglass, this new picture book by debut author Glenda Armand introduces Douglass as a young boy in Maryland, where his mother visits him one night every week, despite the arduous twelve mile walk from the plantation where she works in the fields. She explains to him that every mile represents something different, and she makes the journey go by concentrating on these aspects of her life during each mile of the journey. For example, one mile is for forgetting, another for remembering, another for giving thanks, another for love. Armand is a teacher and school librarian who was inspired to write this story by a comment in Douglass' autobiography in which he remarks that his mother told him he was not “only a child but somebody’s child.” More than a story about the brutality of slavery, this is instead of a story of a mother's deep love for her child, a universal theme that transcends Frederick Douglass' own story. In fact, Douglass was separated from his mother as an infant, and she died when he was a small child. The book is illustrated with beautiful watercolor paintings by Colin Bootman which capture the candlelit slave quarters with glowing light, as well as the quiet peace of the woods through which Douglass' mother walks on her trips. This is not a picture book biography designed to be suitable for reports, although it could be used in conjunction with other books on Frederick Douglass for classrooms or homeschoolers. It is also well suited to be read on its own and could spark a child's interest in other aspects of African-American history. The book includes a brief afterword which gives additional details of Douglass' life after he escaped from slavery and his many accomplishments, including the fact that he gave his mother credit for much of his success. Unfortunately I've never read Dee Brown's iconic Bury My Heart at Wounded Knee, the best-selling history of the American West from the point of view of the Native Americans that was first published in 1971. In this new book written for younger readers, Dwight Jon Zimmerman has adapted Brown's 500+ page book for a younger audience, adroitly simplifying but not "dumbing down" the complex and interwoven stories of the different Indian tribes in the original by concentrating on the Great Sioux Nation. As Zimmerman explains in his preface, the Sioux's epic fight against the white man represents the struggle of all the Indian nations in many ways, and includes the stories of some of the most famous warrior chiefs in Indian history, among them Sitting Bull and Crazy Horse, as well as some of the most famous battles and events. 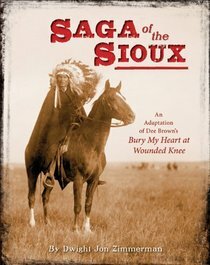 Zimmerman condenses and abridges Brown's work to concentrate on the Sioux' story, but also adds a first chapter providing background on the Sioux people as well as an epilogue discussing what has happened to the Sioux since the infamous massacre at Wounded Knee in 1890, and their attempts through the U.S. courts in modern times to get their sacred lands, the Black Hills, returned to them. I must comment that I found this an incredibly difficult book to read; not because of complicated vocabulary or poorly written narrative, but because of the tragic nature of the material. In fact, the book made me think about how many narratives of the Holocaust I have read, and yet how this tale of the white man's betrayal again and again of the Native Americans was so hard for me to digest. That's perhaps a topic for another blog post, but even in stories (whether fiction or non-fiction) of the Holocaust there's a few good people who tried to rescue Jews or otherwise help them, whereas it doesn't seem like any of the white people appreciated the Indians' culture and lifestyle at the end of the 19th century. Undoubtedly there must have been some more forward looking whites, but where were they? Putting the Indian children into boarding schools to train them to be "white", it seems. This narrative starts in the years leading up to the Civil War, in which the Sioux of Minnesota agreed in treaties to surrender nearly all their land, thus having to learn to farm like white men and depending on annuities from the government, and covers the story of the Indian Wars that ensued over the next thirty years. Over and over again the Sioux were betrayed by the U.S. government, who would appear to negotiate treaties in good faith that they seemed to have no intention of keeping. The narrative is magnificently illustrated with many full page photographs of various Sioux chiefs as well as American leaders, maps, as well as historic paintings and lithographs. Zimmerman allows the Sioux leaders to tell their own stories, continuing Dee Brown's practice of including ample primary source materials (primarily oral histories). This book includes abundant backmatter, including a timeline of Sioux history from 1851 to 1909, a glossary, information on the Sioux calendar, recommended reading, suggested websites, and an index. I expect this excellent book to be nominated for many non-fiction awards; I would highly recommend it for upper elementary school through middle school, as well as for adults who would like an easy-to-follow overview of this shameful part of our nation's history. I am delighted to welcome debut author Katherine Schlick Noe to The Fourth Musketeer. Katherine has kindly prepared a guest post about her first novel, Something to Hold, reviewed yesterday on this blog. What was it like living on an Indian reservation? For as long as I can remember, other non-Indians have asked this question. It’s always been hard to explain. Like all of the foundational, complex questions of our lives, there are many answers. They finally began to solidify when I started to write Something to Hold. This work of fiction is inspired by my memories of living on the Warm Springs Indian Reservation in central Oregon in the 1960’s. Like Kitty’s dad, mine was a forester with the Bureau of Indian Affairs. He and my mother left Iowa in 1950 to take a job on the Colville Indian Reservation in north-central Washington state. They didn’t know then that they would spend the rest of their lives working with and living among Indian people. My brothers and I were born on the Colville Reservation, and we moved every four years, living near Washington, DC and on the Warm Springs and Yakama Reservations. The years at Warm Springs were pivotal for me, as they are for all children between the ages of seven and eleven. Something to Hold is grounded in universals. We all long to find a place to belong, to make friends, to feel connected and rooted. The book also explores a unique perspective of a non-Indian outsider’s growing awareness of prejudice, including her own. My writing began with one memory: In the fifth grade at Warm Springs, a classmate I both feared and admired refused to read out loud, and our white teacher took her out into the hall, shook her, and left her there. Reading out loud, one paragraph at a time, was a normal practice in every school I had attended. I hated it – so boring to listen to other bored kids read something boring – but I would never have refused. I couldn’t understand why my classmate would defy this teacher, who allowed no disobedience of any kind, in this way. That event had a profound impact on me and is one reason that I eventually became a teacher. No child should be humiliated that way. That event is also what moved me to write about living at Warm Springs. Having wrestled with the memory for over 30 years, I did what we encourage young writers to do -- started listing all that I could remember about it. Then I began to tell the story. I was writing in order to make sense for myself, to understand why she would dare to do something I would never have had the nerve to consider. But, of course, I couldn’t remember everything, and that’s when the fiction took over. As Something to Hold took shape, I had a chance to meet my classmate again. Both of us now grown, we visited over our class photo, talking about how life had turned out. It was clear that hers had been filled with hardship, so different from my own. When I asked her about the event that had affected me so deeply, she looked me in the eye and said, “It never happened.” I knew in that moment that this was not my story to tell. So I took that episode apart, changed the details but kept intact the power and fear and strength of will – all of the emotions that were so influential for me -- and gave them to my two antagonists, Raymond and Jewel. In the chapter “The Capital of Vermont,” Raymond and Jewel stand up to their teacher and triumph over humiliation. And Kitty learns something powerful about speaking out for justice. Many of the events in Something to Hold are based in truth. The only way I could begin was to build Kitty’s story around my memories: a Bible-quoting teacher, the death of a child, a boy who fell through the ceiling of my classroom while working in the school attic, how razor blades horribly derailed an art project. I created a series of episodes tethered loosely to reality – and then slowly wove in the characters. This image guided me: A basket maker begins with a tangle of warps and wefts, a mess of strings held in her hand. Carefully, intentionally, and sometimes magically, she weaves them together into something beautiful, powerful, and enduring – just as a writer weaves with words. My goal was to create a tapestry of characters that manage to find their own way and also to help each other live with courage and hope – especially when it’s a struggle to do so. 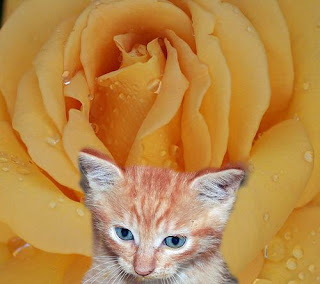 I hope young readers will identify with Kitty, Raymond, Jewel, and Pinky and the ways in which they reach across a chasm of difference to connect with one another. I have my classmate to thank for getting me started.